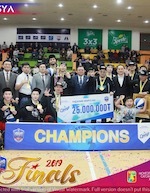 Arhangai celebrate 2018/19 title as they triumphed in the decider against Khovd 115-107 and won the Final 4-3. The third period was decisive in the game as Arhangai produced a 35-27 surge. Jeff Allen top-scored 23 points and was named the Best Foreigner of the year. Battur Ganbold notched 21 and Azbayar Tserendagva (196-G-89) poured in 20. Dulguun Enkhbat (190-G-92) replied with 30 points in the losing effort. Westley Hinton (203-F/C-91, college: Troy) collected 20 points and 13 boards, whilst Enkhbat Dorj (G) had 18. Khovd and Arhangai are tied once again in the Final series. In Game 4 Arhangai posted a massive 153-136 win. Sanchir Tungalag (190-G-89) top-scored for the winners with 40 points and 11 rebounds, while Jeffrey Allen poured in 31. Azbayar Tserendagva (196-G-89) delivered 19 and Enkhbaatar Onolbaatar scored 12. Westley Hinton (203-F/C-91, college: Troy) replied with 28 points and 14 boards in a loss, whilst Dulguun Enkhbat (190-G-92) nailed 24. Arhangai and Khovd exchanged wins in the Finals as the score is tied at 1-1. Arhangai won the opener 124-114 as Azbayar Tserendagva (196-F-89) stepped up with 26 points. Jordan Woodard (183-G-95, college: Oklahoma) followed him with 23 points, while Dorj Enkhbat scored 28 in a loss. In game 2 Khovd replied with a 114-100 victory. 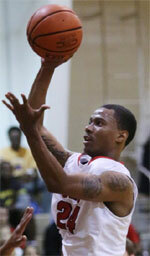 Westley Hinton (203-F-91, college: Troy) top-scored for the winners with 25 points and Westley Hinton poured in 22. Onolbaatar Enkhbaatar (196-C) answered with 23 points and Azbayar Tserendagva notched 20.